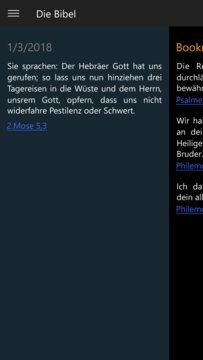 This bible reading app contains German and English Bible text. Each verse can be viewed and compared per click in various Bible translations such as the "Schlachter 2000", the "New King James Version" and the "Neue Genfer Translation". Verses can be found, highlighted, sent to friends and bookmarked. In addition, notes can be written directly next to the Bible text and are thus immediately visible when reading the verses. These notes, bookmarks, and highlights can then synced between different devices.